Face-to-Face with RIA (Roving Information Assistant) is also available for consultation or one-on-one help with any of the services or resources available in the Libraries from Monday to Friday, 09:00am to 06:00pm. This service is limited to helping patrons find answers to research questions, bibliographic and technology instruction, and reader’s advisory; each session lasts for 30-60 minutes. c. Patrons are entitled to avail of a maximum of 2 appointments per month. 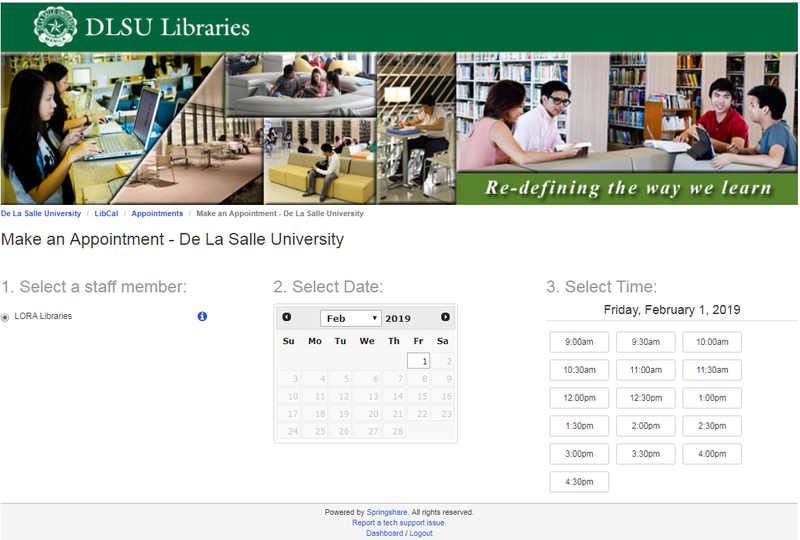 1st Step: Visit the DLSU Libraries website. 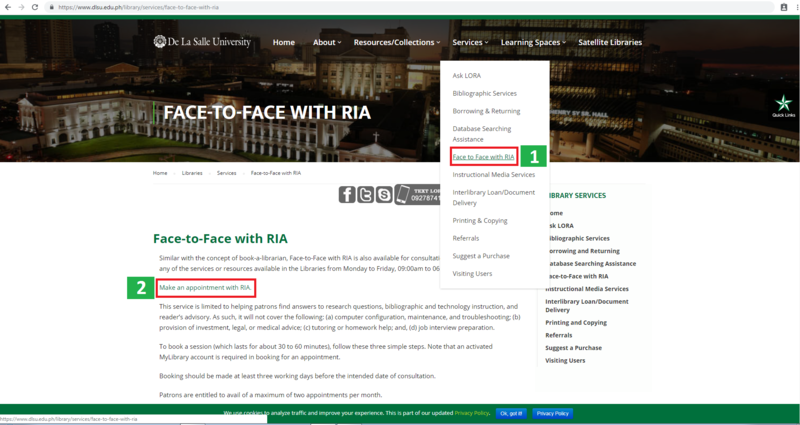 Under the "Services" section, click "Face to Face with RIA"
2nd Step: Click the link "Make an appointment with RIA"
3rd Step: Follow the process of selecting a 1. Staff Member ie. LORA, the 2. Date when you intend to have the consultation, and the exact 3. Time Slot. 4th Step: Provide all the necessary details ie. 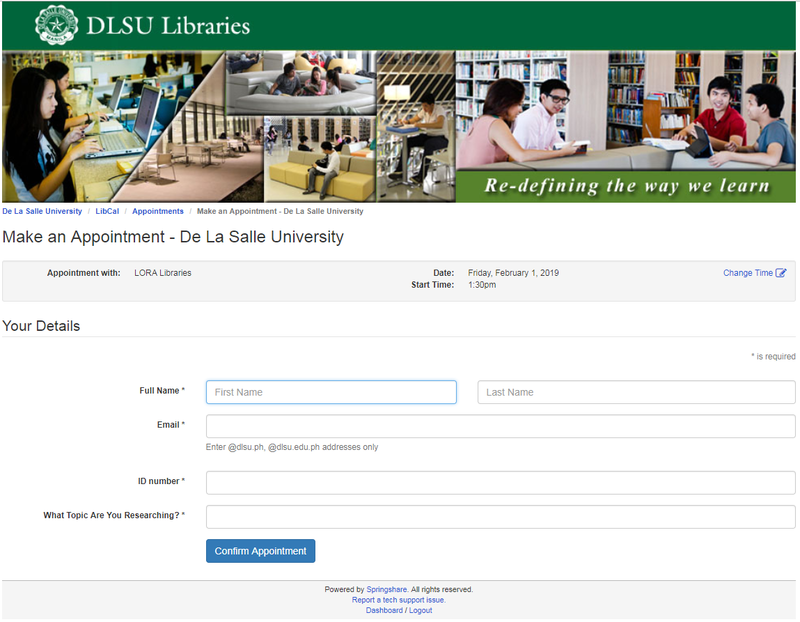 name, email, ID number, and the general/specific research query. Don't forget to confirm your appointment.